This is Savannah. She is adorable. 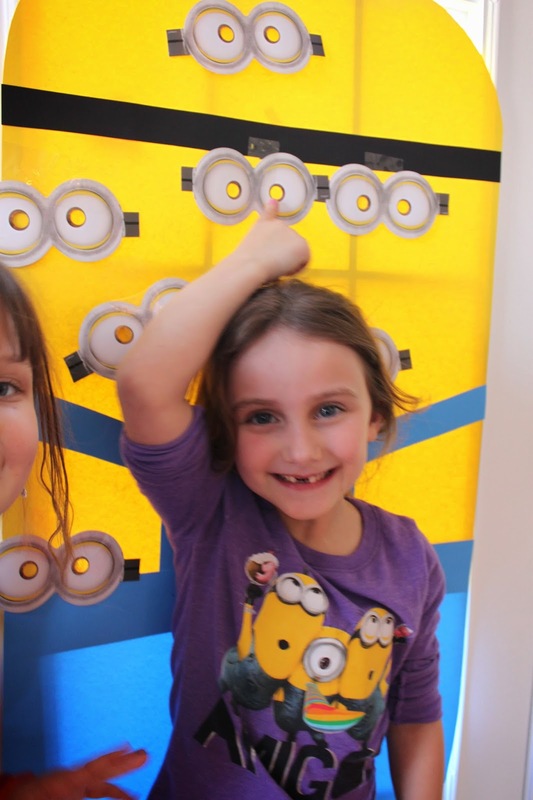 She also really really really really really really really really likes minions. PS- this level of writing skill is why I get paid the big bucks. 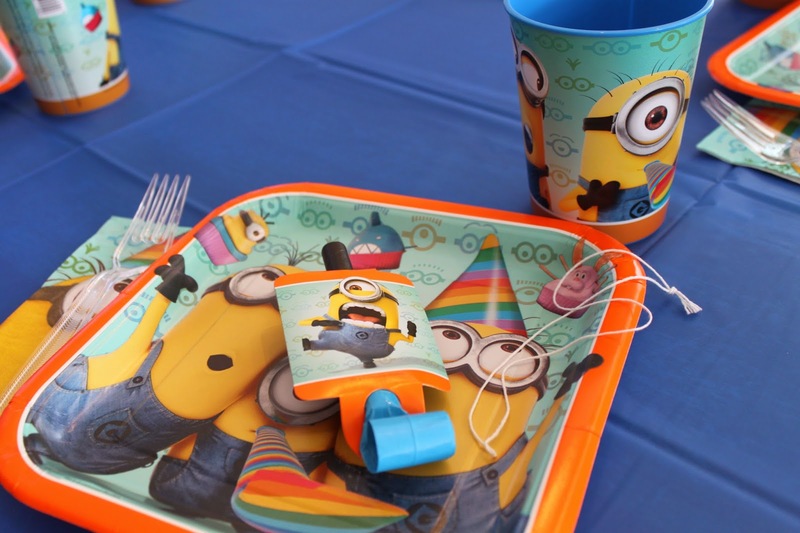 So for her 7th birthday we had a minion party, which, apparently, many of you were interested in having also! So, here’s what I did. 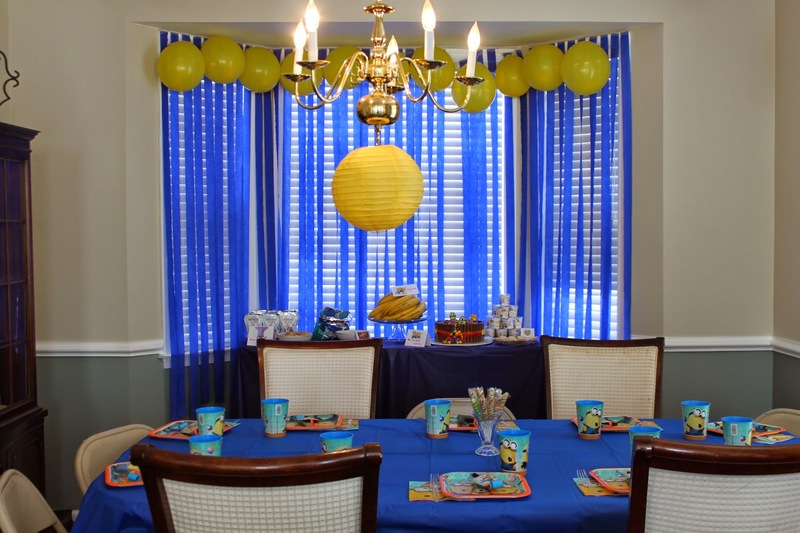 Above you will see a bay window with blue streamers and yellow balloons. 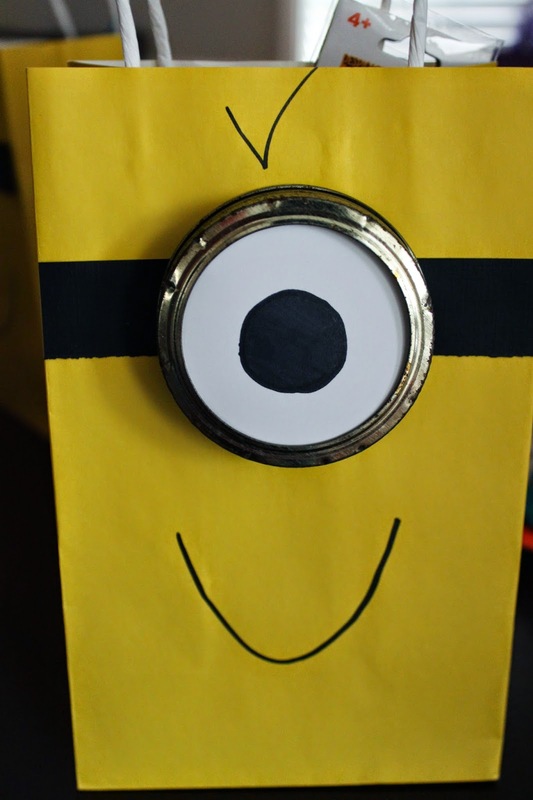 I also got yellow paper lanterns, which you can turn into minion faces if you want! I am a giant dork and make themed food. These are “shrunken moons” like from the movie. 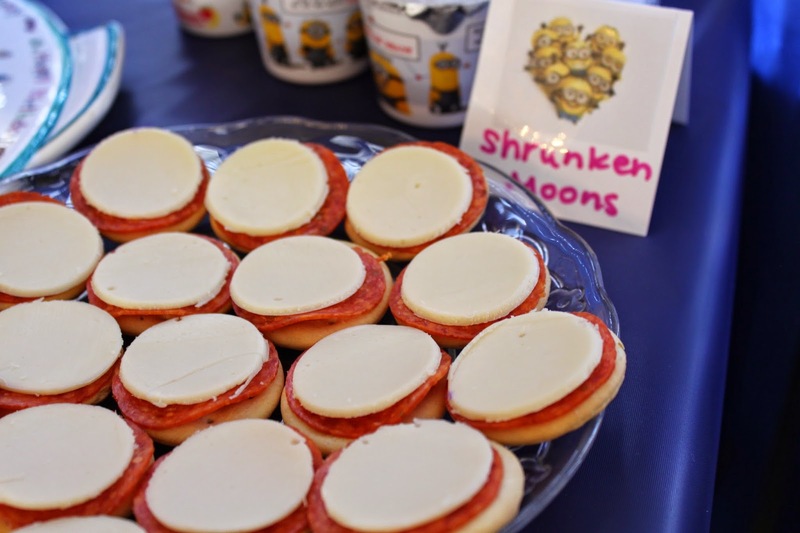 They were just going to be the white cheese on the white crackers (these are round Saltines) but Savannah likes pepperoni, so…our moon is red. Whatever. 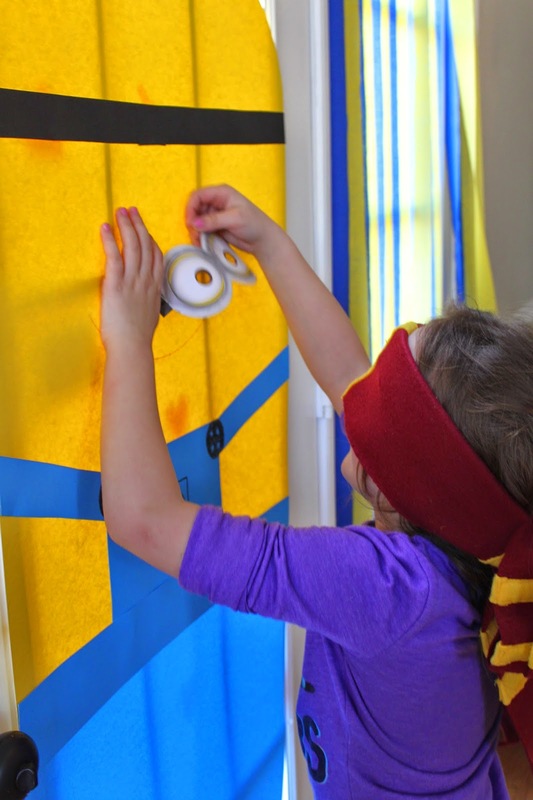 I made pin the eyes on the minion out of posterboard, and I found the eye masks at Target. 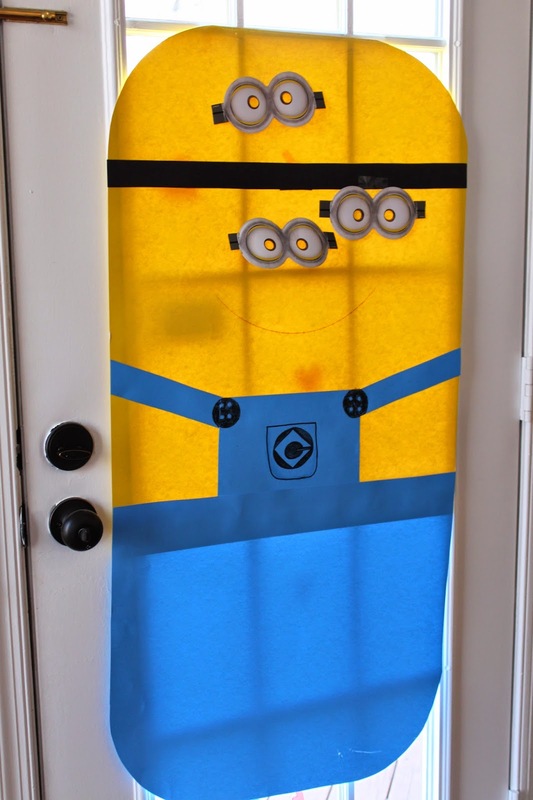 I just cut the edges off so they were just eyes. 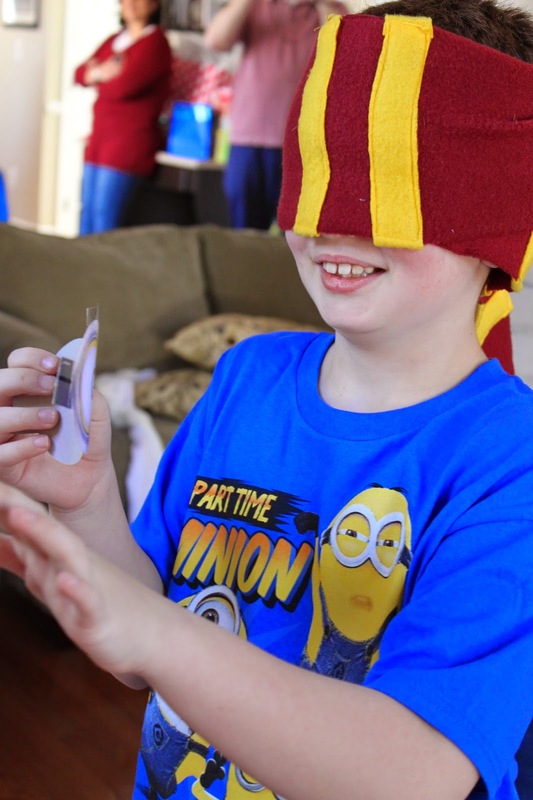 Yes, we are using a Griffyndor scarf I made for my son’s Harry Potter birthday as a blindfold. 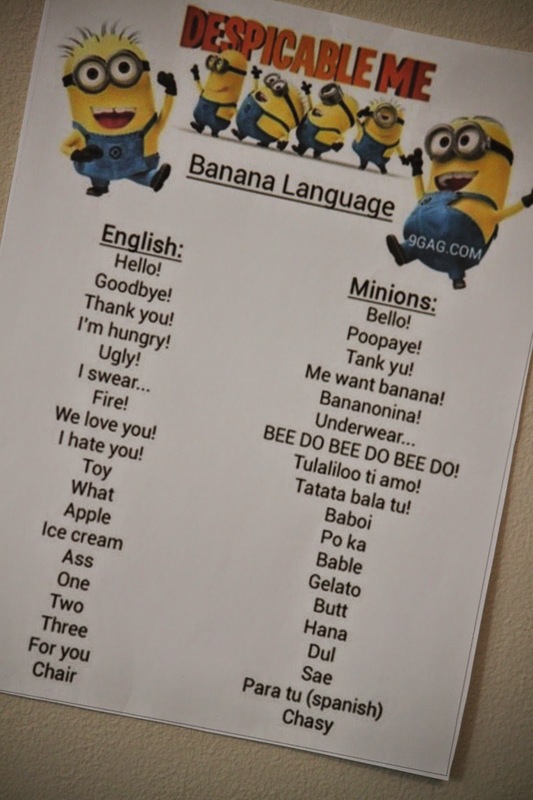 I forgot about needing one that was minion-y! These gift bags were super simple. Black paper, black marker, and the eyes are just the tops to Mason jars with an eyeball on white paper. 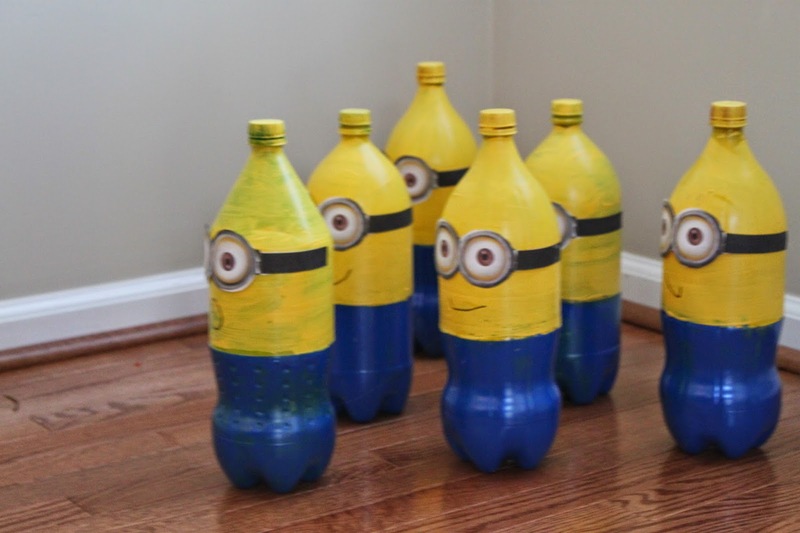 Minion bowling- we used spraypaint on empty two litre bottles. Just a note- you’ll want to make sure these are REALLY REALLY dry or they’ll leave paint on your hardwood floor and you’ll have a panic attack. PS- You’re gonna want some Goof Off. And maybe a magic eraser. I am a dork. I don’t know what else to say. 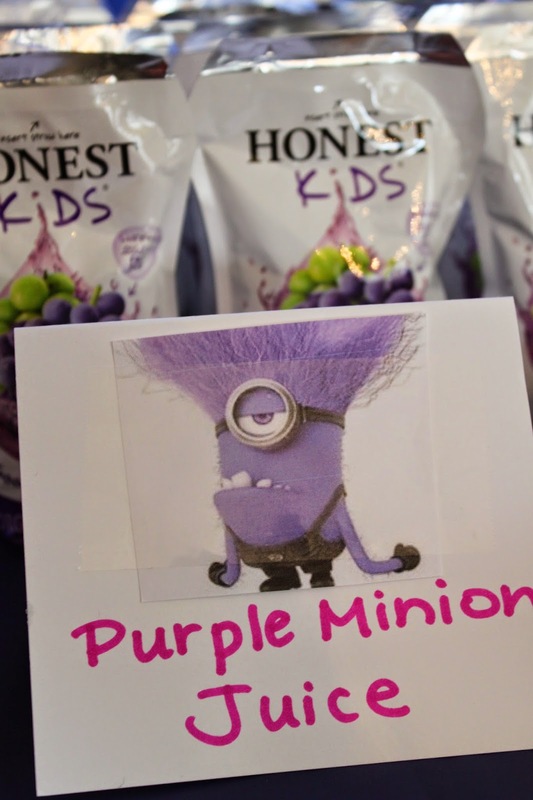 Yes, I did Purple Minon Juice in the form of Honest Kids Grape Drink. 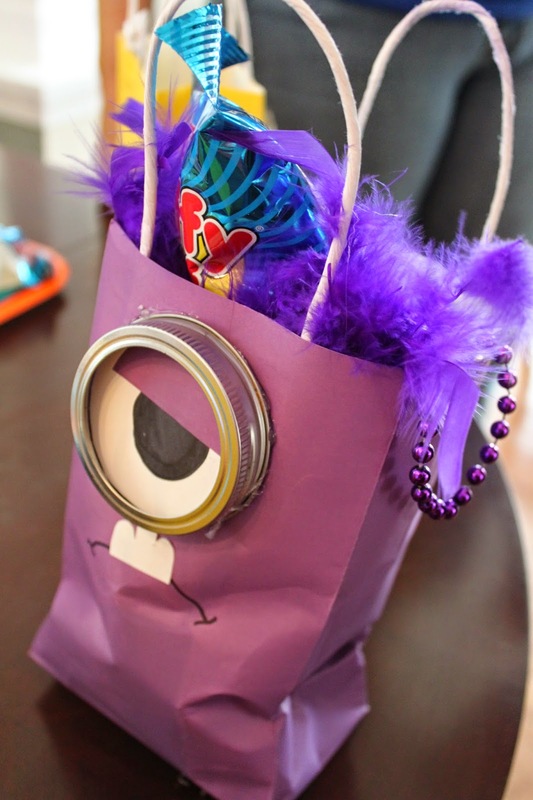 Same concept on the gift bags with a little purple feather boa to make crazy purple minons. Our pinata was filled with cotton candy (it’s so fluffy I’m gonna die! ), necklaces, tattoos, and candy, and then we sent home a unicorn horn and a cup with each child, too. I just bought the plates at the store. I had a plan for really cute polka dot stuff, but my daughter wanted these, so it’s what she got. I am obsessed with the Party Co in Manassas. It’s amazing. 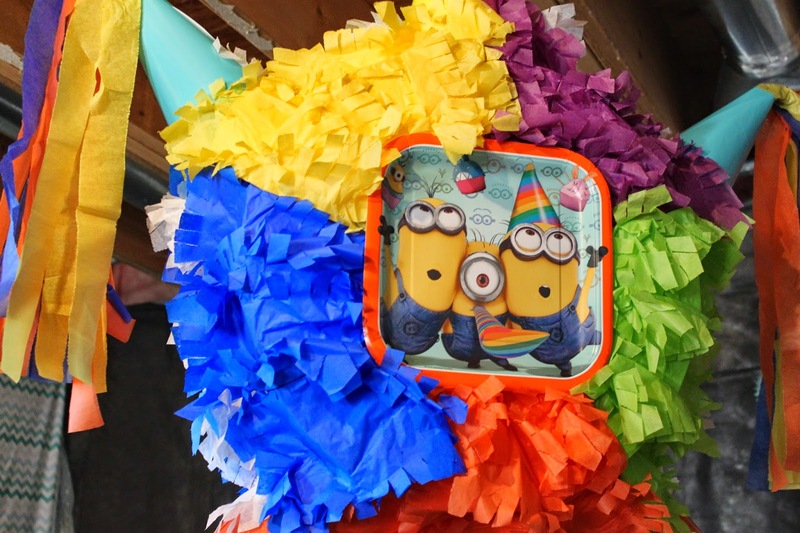 They had minion shaped pinatas, too, but they were a little smaller than I wanted, so I went with this one. 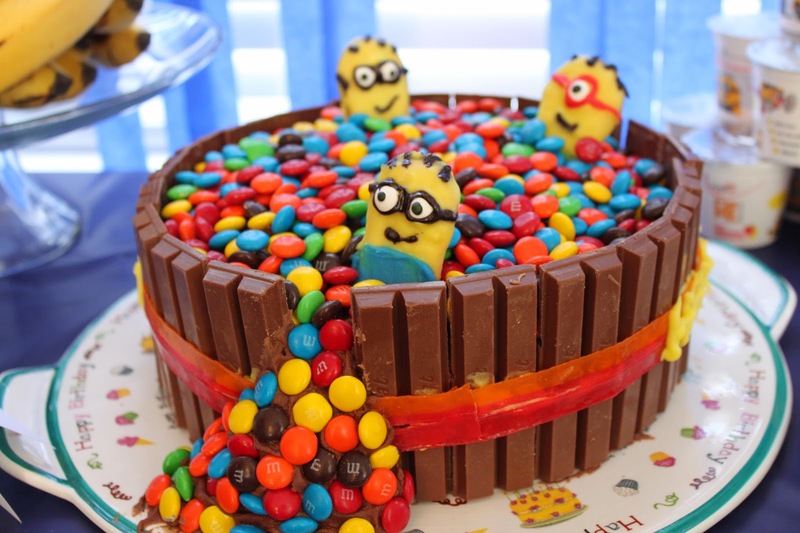 This cake is what you get when you inform your mom the night before your party that you want a “Girl Minion Ice Cream Cake”. 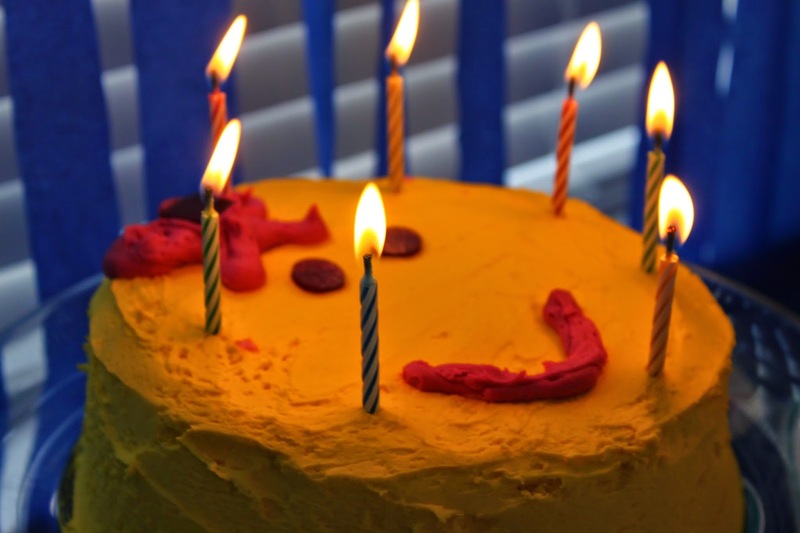 I bought a pre-made ice cream cake from Harris Teeter, scraped the decorations off, and re-spread yellow on top (which I also bought from HT- they’ll sell you frosting by the pound in the bakery and it’s SO MUCH BETTER than that crap frosting in a can (and I am not apologizing for that stance- it’s gross) if you lack either the time or the inclination to make your own. We had a great time. 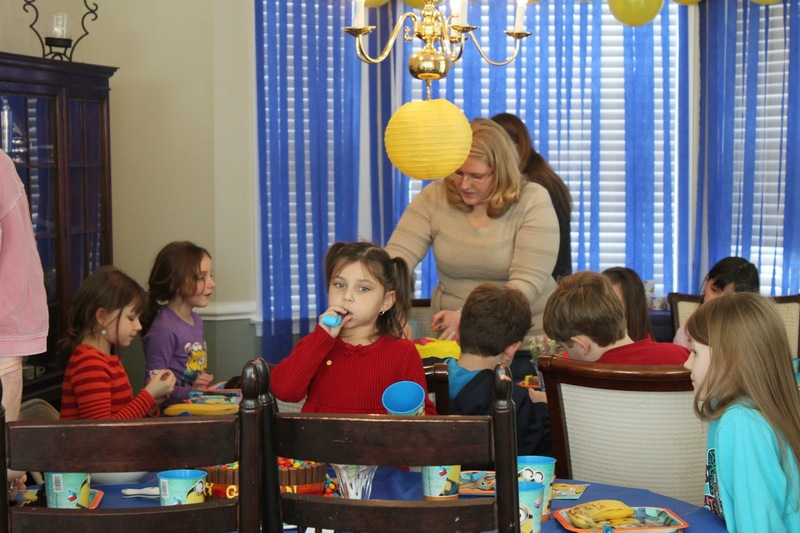 The kids arrived, played a little or colored on some sheets I printed off, then we played games, had snacks and cake, did the pinata, and watched the movie. The party ran from 2pm-5pm, and if we weren’t watching the movie, 2pm-4pm would have been more than sufficient.